5. Switch function to choose if probe power supply or grounding function. * Performs every type of service including power injection, measurement, ground testing, polarity checks, continuity testing and components activation. *Tests for bad ground contacts instantly ,allowing you to follow and locate shorts fast without wasting fuses. *Instantly checks continuity of switches,relays and diodes. * Built-in flashlight enables you to work in the dark. * Extremely easy to use and highly reliable. Instantly identifies positive, negative and open circuits.--Instantly checks continuity of switches,relays and diodes.--Extremely easy to use and highly reliable. Function of Auto Diagnostic Tool: 1. Voltage Testing Function 2. Diode testing function 3. Resistance testing function 4.Frequency testing function 5. Switch function to choose if probe power supply or grounding function. Tests for bad ground contacts instantly ,allowing you to follow and locate shorts fast without wasting fuses. Diagnostic Tool Circuit Tester-YD208: Instantly checks continuity of switches,relays and diodes. 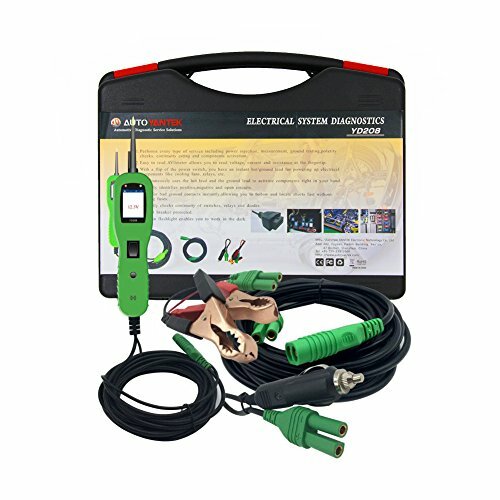 Circuit breaker protected--Built-in flashlight enables you to work in the dark--High quality and useful workshop circuit tester tool.--20ft(extendable)cable provides excellent accesssiblity to test along the vehicle. If you have any questions about this product by Outzone, contact us by completing and submitting the form below. If you are looking for a specif part number, please include it with your message.